Creating a Custom Theme Song for ILEA (The International Live Events Association) was a pleasure. It took longer than usual to release because after the original production was completed, the organization decided to change their name. Their original name / acronym was ISES, which of course sounds like ISIS (the terrorist organization). ISES had used their name happily for many years until recently, when ISIS appeared in the Middle East. It was a good idea for ISES to re-brand as ILEA. When ILEA declared their new name in May 2016, I had to re-write the chorus and bridge of the Custom Theme Song which I had completed previously. Since they liked the original version so much (but we refrained from releasing it due to the name change), I kept the chords, melodies and production. It’s not always “cool” to mention the name of an organization literally in its song (an overlying theme or image that represents them can sometimes be better), but this was for re-branding, so it was appropriate. Of course, literally singing The International Live Events Association would have been too long, while pronouncing their acronym (ILEA) would not have rhymed with much. Rhymes are not necessary to have in a song, but they do help with a song’s catchiness. That said, I decided to pronounce every letter in their acronym: I.L.E.A. It would make their name clear and unforgettable. Rhyming the last letter (“A”) with words like “say” or “day” didn’t lead to useful lines in the lyrics, so I re-used some of the rhymes from the letter “S” in the original I.S.E.S. version. It worked out pretty well. 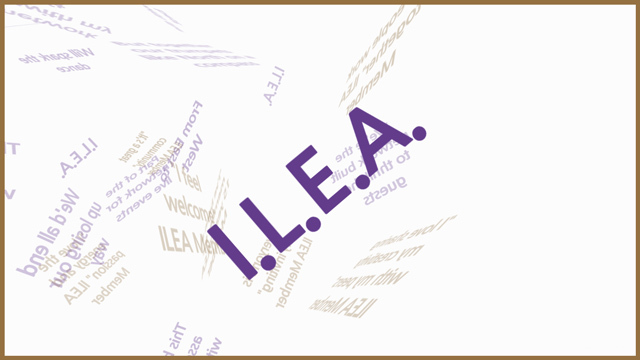 Since ILEA is an international association, using directions in the lyrics (East, West, North, Compass) would emphasize their world-wide membership. If you watch the YouTube lyric video above, you’ll get the gist of what the association is about, so I won’t deep-dive into the lyrics. The short story is that the lyrics are written from the perspective of an event planner who is admiring her helpful ILEA network at her event. This is something most ILEA members can relate to. That brings us to the music itself. The decision to make the song mostly mid-tempo electronica was easy. The target market for ILEA is very broad age-wise and interest-wise, so it wasn’t necessary to make a pure rock or pure hip-hop or dance-dominant (those are just examples) production. However, since many of the ILEA members are event planners, a production that was modern and classy was a must because those same elements are what event planners try to produce at their events. Going with some mid-tempo electronica did the trick. That said, I did include a few modern “real” instruments like acoustic guitars and horns in the background. These can please the ears of slightly older listeners and fans of all music genres which might leverage such instruments (adult contemporary, country, etc.). The music also needed to be comfortably upbeat to suit the celebratory nature of the organization, versus being at the other ends of the tempo and melodic spectrum. My goal in every song is to have a strong and catchy and memorable chorus, and I think this one delivers. After hearing the nearly final version, one of the ILEA Vice Presidents envisioned adding various sound effects to emphasize their members’ presence at live events, parties, weddings, celebrations and so on. He had a number of good ideas, but most of them I knew would be too “quiet” to be heard above the music itself. If you didn’t already know, it’s difficult to take sounds that are “quiet” in the real world and make them “loud” in a full music production. Have you ever heard something like the sound of bed sheets rustling over a rock song? Probably not. But something like a cowbell has a very loud character and can be easily heard in the densest mixes. The solution was to add relatively “loud” sounds like glasses chiming up close and crowds cheering. Even so, to make both of those sounds heard above the music, I had to blend many types of glasses and different crowd recordings together, while treating them with aggressive equalization and compression. Can you hear them at the very beginning and end of the song? The last interesting thing I’ll note here is the appearance of many spoken voices in the middle bridge of the song. A couple of years ago, I began integrating audiences into my live shows and recorded music. Most people get a real kick out of it, so I decided to interview ILEA members at one of their internal events. My question to attendees was, “What do you like most about ILEA?” I recorded their responses into my iPhone with a high-quality microphone, then brought the results to my studio and edited them into the music. It added a lot of life to the middle of the song instead of hearing the usual guitar solo. This song took around 70 hours to write, record, mix, master and deliver. It was worth it. Let me create a song for you for a big meeting, a wedding, a celebration, any event or for a marketing campaign. Like a diamond, a song is forever!